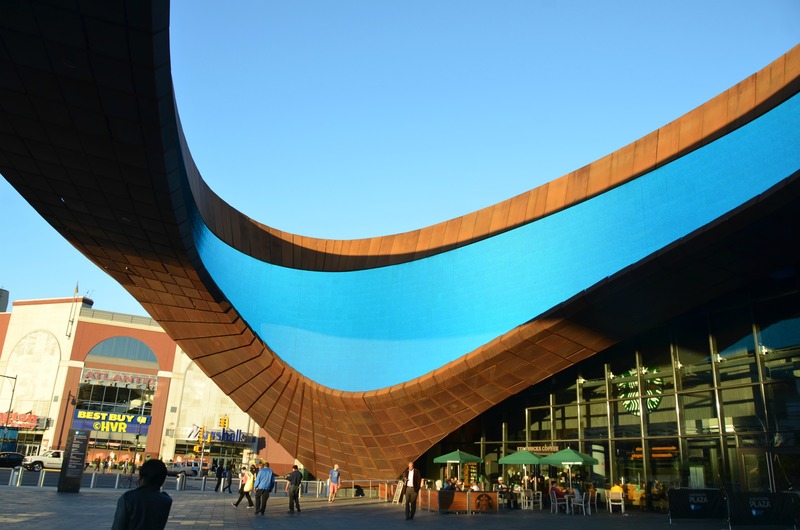 Photo of the day: A PIECE OF THE SKY – BARCLAYS CENTER OCULUS – Built in 2012 to much controversy in downtown Brooklyn, the brand new indoor Barclays sports and concert arena does create a mesmerizing presence to a once decaying area. Built of rusting/”pre-weathered” steel plates made to emulate Brooklyn’s brownstones, it seems to float over the area’s Atlantic Avenue transit hub. An 117-by-56-foot (36 by 17 m) “Oculus” extends over a 5,660-square-foot (526 m2) section of the plaza outside of the main arena entrance, and contains an irregularly-shaped display screen that loops around on the inside of the structure offering you at times the illusion of a slice of sky.